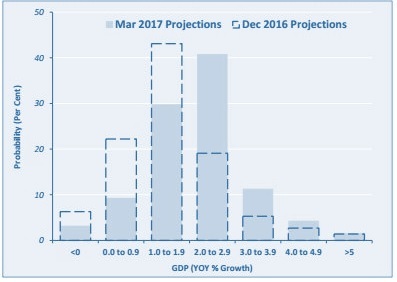 According to the central bank’s half-year macroeconomics review, Singapore’s GDP is expected to expand by 1% to 3% in 2017, and the figure will likely exceed 2%. In Q1 2017, the economy grew by 2.5% on a year-on-year basis, which is higher than the 2.4% forecasted by a Reuters survey. In the first quarter Survey of Professional Forecasters conducted by the Monetary Authority of Singapore (MAS), economists and analysts also increase the growth forecast for 2017 from 1.5% to 2.3%. This is the first time that experts have increased their growth expectation for the economy in 2017. The latest quarterly Business Optimism Index (BOI) released by the Singapore Commercial Credit Bureau (SCCB) rose from -1.2% to 2.66%, signaling an increase of business confidence in the economy. Prime Minister Lee Hsien Loong noted that economic outlook is encouraging, given that the economy has performed quite well in the first quarter. Singapore Ministry of Trade and Industry (MTI) also reported that the global economy’s outlook has brighten, as growth prospects of developed economies improved. In Asia, the economy is expected to expand by 4.8% this year, and external demand remains a key driver of growth for both Singapore and the region. Trade-related sectors such as manufacturing, transportation and storage should benefit the most from increased global economic activity and recovering global demand. Manufacturing sector keeps growing strongly, which increases by 8% on a year-on-year basis. This growth is mainly attributable to the electronics and precision engineering segment, which is driven by high global demand for semiconductors and semiconductor manufacturing equipment. The sector is projected to continue this trend in 2017. Finance and Insurance sector’s forecast has mildly improved thanks to a slight increase in forex and security trading activities. Whole-sale trade sector also has a lot of potential, especially for exports. On the other hand, outlook for the construction sector has decreased significantly following a decline in private building projects. Accommodation and Food Services sector is also expected to decrease, as local market tends to lag behind. Key uncertainties involved for Singapore include anti-globalization sentiments, political risks and economic unrest in Europe and the U.S. Recent global movements such as the Brexit referendum, Trump’s election and the U.S pulling out from the Paris Climate Agreement signal warnings about anti-globalization and protectionist threats, which might negatively affect Singapore’s trade reliant economy. There is also the concern that China might tighten its monetary conditions. This will have a detrimental effect on the economy of Singapore, as China is one of the most important trade partner of the island nation. In the year 2017, the cost to operate a business in Singapore is expected to continue to rise. The Consumer Price Index (CPI) is projected to come in between 0.5% to 1.5%, with energy-related cost as the main driver behind the increase in CPI. Despite certain unavoidable uncertainties, Singapore economy has shown improvement in 2017 and is looking relatively promising in the future. If you are interested to set up your own business in Singapore, and would like to have more detail information, do not hesitate to contact us at (+65) 6735 0120 or send your questions to email@healyconsultants.com.